With the success of 2010’s World Championships still fresh in the mind it seemed implausible that a year had passed already and it was time to do it all again, but this was the case on Monday 31st October as fighters and martial artists from the BCKA finished packing their suitcases and prepared for the journey to Cadiz, Spain. Unfortunately the whole team were not able to travel together with the majority of the team flying out from Birmingham in the early hours of Monday morning and BCKA Lincolnshire’s fighters flying from Manchester later in the day. All in all this year the BCKA had 13 fighters and 1 martial artist representing in the kata division competing in the tournament with representatives from Northants, Lincolnshire and Peterborough areas. There were a number of competitors from the BCKA that were set to experience the World Championships for the first time and some that were old hands to it now. After months of hard and intense training there was a great team bond and sense of optimism surrounding the team’s chances of success and spirits were high. For those flying out from Birmingham the flight was relatively uneventful and upon landing at Malaga airport at around 11am they faced a 3 hour coach journey to Cadiz. The team were met with some stunning landscapes and views as they travelled through southern Spain in a warm and sunny climate – jumpers off, sunglasses on! Arriving at this year’s venue, the Valentin Sancti Petri Hotel, the team were quickly checked in and went through to weigh in. For most weigh in was straight forward but several team members had to work a little harder to make the necessary weight. Following on from this the team were free to explore their home for the week, chilling around the pool and grabbing a bite to eat whilst waiting for the rest of the BCKA team to arrive. 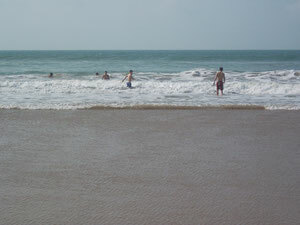 The hotel and resort were first class, with the beach just a short walk away. Later that night the whole team was complete as the remaining BCKA competitors arrived and checked in. Unfortunately it was too late for weigh in and these fighters would have to do so in the morning. Tomorrow there would be a WKC Team England photo and the kata eliminations would begin with no fighting scheduled to start until the Wednesday. After the early starts and long day of travelling most of the BCKA party headed off to bed reasonably early ready for an early start the next day. 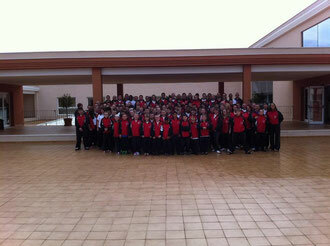 The first full day in Spain for the BCKA team saw WKC Team England photographs and the kata competition leaving everyone free to relax and chill out around the pool and on the beach. First up were the team photos, relatively straight forward with photos taken for the whole team, the points team, the continuous team and the kata team. The kata categories were not scheduled to start until mid-afternoon so the team were left to explore the local area and spend some time relaxing together. 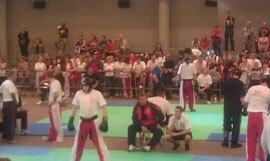 The kata categories started at 3pm and for the first time the BCKA were represented in this part of the competition. 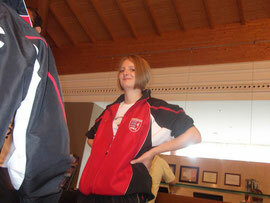 Isabelle Leggett from the Lincolnshire area was due to compete in the Junior Girls Chinese soft style. After rather a long wait for her category to be called, Izzy performed Bak Pye Gern with the full BCKA team watching and supporting her. She performed the set very well and narrowly missed out on a place in the final. After the kata competition ended the team from the BCKA were off for dinner and early nights ready for the opening ceremony first thing the next morning and as most of the team were in competition with adult and junior continuous categories and cadet points fighting scheduled for the day. The next morning started with the Opening Ceremony, as in previous years all nations fully kitted out in team tracksuits entering the fighting arena behind their nation’s flag. The atmosphere was incredible with so many top quality fighters anticipating the start of the fighting and after some short speeches and awards the competition was declared open. Elimination rounds were scheduled to take place over the next two days with kata finals and team events on the Friday and all light contact and points fighting finals on the Saturday. 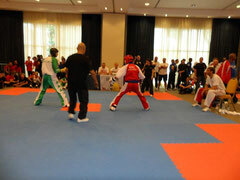 This year’s format meant that more or less all BCKA fighters would be fighting on both days of elimination rounds. First up to fight from the BCKA were the women light contact fighters, Jo Redman and Cat Harris in the -70kgs category. Cat was first to fight against a Welsh opponent. Following her bronze medal in last year’s competition, Cat was keen to improve on last year’s result and at the very least equal it. With added experience over the last year Cat went into the fight with a better skill, fitness and mental approach and won the fight clearly over the two rounds taking her into the semi final. In the semi final she came up against last year’s World Champion an Irish girl. Unfortunately this girl was too strong a competitor for Cat and she was unable to progress in the category taking home a bronze medal, the first for the BCKA. Jo Redman was also competing in the same category and came up first against a tough Canadian. Landing side kick after side kick to the Canadian’s head with some great movement around the mat, Jo progressed through to the semis where she faced a German fighter. This was a fight with many stoppages due to the German having a nosebleed but this didn’t distract Jo from the task at hand. Mixing it up with a range of head kicks and punch combinations, Jo for the second year in a row found herself in the final of the World Championships. Following the women’s light contact were the men light contact eliminations. 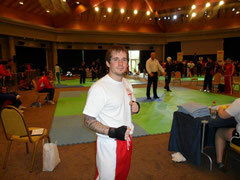 First up was Richie Wooton in -75kgs division. Richie was drawn against an Irish fighter who also just happened to be the current World Champion. Showing all of the grit, determination and work rate that saw him win the Irish Open earlier this year, Richie approached the fight with everything he had. However it was just not enough to take Richie further in the competition as he lost on a split decision. This year fighting in the -70kgs weight category was Kevin Williams. After two years winning double bronze medals Kevin hoped to go one further and started his light contact campaign against a French fighter. Despite carrying a couple of knocks into the competition Kev put in his usual strong display against this opponent taking him into the next round where he fought an Italian. Here he constantly pressured his opponent, beating him to the punch and making good use of the mat. 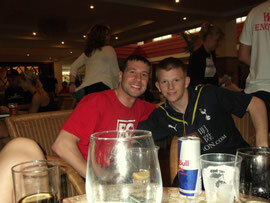 After progressing through to the semi final Kevin met with an Austrian fighter. And after a hard fought contest and suffering an elbow to the lip, Kevin narrowly missed out on a place in the final earning himself a bronze medal. Next up was Lee Murray entering the light contact division for the first time on a world level in the -60kgs weight division. After establishing his position in the BCKA team over the last year Lee was keen to prove he was a competitor to be taken seriously at this level and prove that he did! Lee was thrown into the semi final against German opposition and made it look easy. With a stunning array of spinning kicks, jump back kicks and hand combinations, Lee eased his way through to the final in style. Making his first appearance in a World Championship and a late entrant into men’s light contact -80kgs category was Peterborough’s Marco Broccoli. Marco had not fought many light contact fights competitively and found himself up against a strong Canadian fighter. Despite putting up a good fight and showing promise in light contact, Marco could not progress further in the competition. With all the men light contact fights over with for the BCKA next were the cadet boys points fighting categories. Fighting in these were Jack Bristowe, Reece Dalton and Courtney Brown. Jack was up first in the -60kgs division. Jack had had a whirlwind year with much success and marked improvement in both points fighting and light contact. Earlier in the year he had won a bronze medal in the Irish Open and here he was keen to go one better at the World Championships. Jack was drawn against last year’s World Champion, a fighter from Ireland. Despite landing clearer shots Jack was just a fraction behind his opponent speed wise and left the competition at this stage. Nevertheless he fought very well. Fighting from the -65kgs category were Reece Dalton and Courtney Brown. Reece from Lincolnshire was attending his second World Championships and found himself up against a Canadian. After a slow start to the fight on Reece’s part, he soon found himself getting into a rhythm and managed to claw back a large deficit to make an exciting finish. The end of the fight was point for point and sadly did not end with the points the right way round for Reece. Regardless of this though Reece did incredibly well to pull the fight back and make it a contest at the end and can hold his head high for his efforts. Courtney Brown of Peterborough had attended many Irish Open competitions over the years for the BCKA but found himself in his first World Championships in Spain. 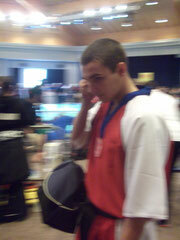 Competing in the same category as Reece, Courtney had been long known for his point fighting abilities in the BCKA having won numerous competitions in the UK. Courtney too was drawn against a Team Canada fighter and began brightly taking the first couple of points. In a fight that turned out to be closely fought, like Reece, Courtney narrowly missed out on going through to the next round. Following on the cadets boys points fighting was the junior boys and girls light contact with the BCKA’s Alex Barrowman Jnr and Sophie Collinson in action. 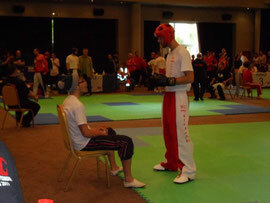 First up was Alex fighting as defending World Champion in the -70kgs category. Alex came up against a fellow WKC England team mate in the semi final and was in usual good form looking incredibly fit, strong and agile following his training campaign. The accuracy, speed and work rate that characterise Alex’s light contact fights were all present and Alex made light work of the round going straight through to the final. Making her debut at a World Championships was Sophie Collinson. Prior to the tournament Sophie had suffered a nasty injury that had required her to undergo an operation just weeks before flying out to Spain, nevertheless Sophie was undeterred and ready to compete. Fighting against a Canadian Sophie got in some excellent blows and fought a close fight just needing to push on and pressure her opponent a little more in order to win. Despite this she had won herself a bronze medal taking the total for the day to three finalists and three bronze medallists. This marked the end of the first day of fighting eliminations with the team headed for all you can eat buffet and some recreation before adult points fighting and cadet boys light contact the next day. The BCKA team arose early on Thursday for the second day of fighting elimination rounds. Most fighters were in action today and things kicked off with the women’s points fighting. First up was Katie Grant in the -65kgs section. 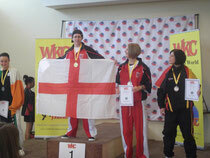 Katie was fighting in her second World Championships and for the first time in the -65kgs category. Coming up against the current World Champion, a fighter from Italy, Katie fought hard and eventually lost out by two points. In the -70kgs division Cat Harris was drawn against a very accomplished Team Canada fighter. Regrettably Cat was unable to progress in the tournament. After a short break the men’s points fighting was scheduled to start and the first of the men to fight was Richie Wooton in the -75kgs category. Following last year’s injury problems, Richie had had a much better year with the BCKA which had seen him triumph in the Irish Open in March in the light contact division and given him a good run up to the World Championships. Richie’s first opponent in this category was an Italian guy and true to usual form Richie used his speed and movement to advantage and went through to the second round. In the second round Richie found himself facing Belgian opposition and even with his best efforts just missed out on going through to the next round. The next men’s category featuring BCKA fighters was the -70kgs category. In this section the BCKA had both Kevin Williams and Grant Brown representing. Grant Brown in his first World Championships put in a stunning performance taking his Italian opponent all the way through to extra time in a gripping point for point thriller. The extra time just proved a little too much for Grant as he seemed to run out of steam, nevertheless it was an eye opening contest with Grant showing just what an asset he is to the BCKA. Next to fight was the experienced Kevin Williams. Kevin first attended a World Championships back in 2001 and had since been trying to win the title that had eluded him having won the Irish Open and every British title going in previous years. 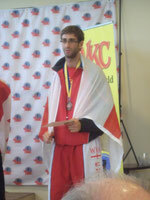 This year he started his campaign against a WKC England team mate. By the end of the 2 minute round, Kevin progressed through to come up against a Team Canada fighter. In a hard fought contest, Kev drew on his experience and utilised his finely honed skills to take the fight and find himself in Saturday’s final. Lee Murray fought next in the -60kgs category against a fighter from Ireland. On form from yesterday’s light contact, Lee approached the fight confidently. On this occasion however Lee just did not have enough to win the fight and left the competition at this stage with a bronze medal to his name. In the -80kgs category Peterborough’s Marco Broccoli was straight into the semi final. Here Marco was drawn against a Belgian fighter. Marco gave a great account of himself in this fight but the experience of the Belgian fighter just proved too much and it was at this stage that the competition ended for Marco. However Marco came away with a bronze medal for his efforts. This signalled the end of the men’s points fighting events with the team moving on to cadets boy’s light contact. First up was Jack Bristowe, a natural light contact fighter from the Peterborough area. Fighting again in the -60kgs category, Jack just happened to be drawn against the Irish fighter he had fought in yesterday’s points fighting. Undeterred by yesterday’s loss to this fighter, Jack in fact had strengthened resolve to get one back on this guy. Showing throughout the fight all the attributes that made him a good light contact fighter, Jack fought the fight of his life really taking it to a tough opponent and was rewarded with a passage through to Saturday’s final. 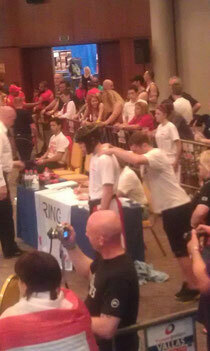 The last of the boys fighting in the cadet boys light contact for the BCKA was Reece Dalton in the -65kgs division. Fighting against a Canadian, Reece too pulled all the stops out of the bag. He landed every kick going including several spinning kicks, pressurised his opponent at every turn and wrongfully picked up a few absurd warnings resulting in him being awarded a minus point. In spite of this minus point Reece did more than enough to win the fight, completely outclassing his opponent yet mystifyingly the decision was given to the Canadian fighter. Following the boy’s light contact was the junior boys and girls points fighting. Alex Barrowman Jnr was up first in the -70kgs category and made light work of his prelim round taking him through into another final on Saturday. 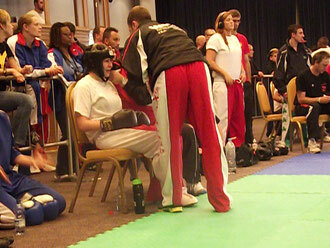 Sophie Collinson was drawn against a tough Canadian fighter in the -60kgs category. This Canadian was all legs and used these to full advantage against Sophie. With a difficult run in to the championships Sophie’s usual movement was not as sharp as usual leaving Sophie unable to progress to the next round. 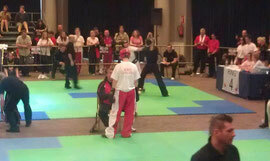 At the end of the second day of fighting eliminations the BCKA had another 3 finallists and 2 bronze medallists. 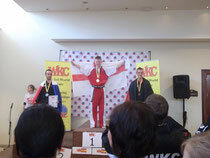 Alex Barrowman Jnr was scheduled to fight for the WKC England Boys Points Team the next day. The BCKA team headed off for some rest and relaxation after a busy day fighting. On Friday team fights were to take place and for the BCKA this meant supporting team member Alex Barrowman Jnr who was a part of the Boys Points Team. The England team were first up against a team from the USA. Alex fought first and put the team ahead with a win. 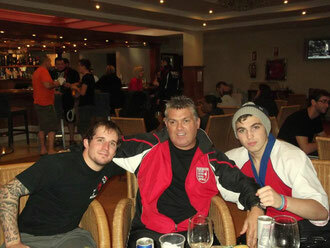 Four fights later and the England boys were through to the semi finals. In the semis the boy’s team again faced more American opposition. Alex started strong in his fight putting himself a few points ahead, however after some dubious scoring decisions Alex drew his fight right in the final moments. In the end both teams had two wins and a draw so the decision went down to point difference and unfortunately for the England lads the Americans were a couple of points in front meaning they went into tomorrow’s final. However another bronze medal for our Alex. With all the team fights finished, all elimination rounds had been completed and finals were left for Saturday. The BCKA had 5 fighters in action in finals the next day, with Alex having two titles to fight for. There was also the prospect of the podium and being awarded medals for the fighters who had already won a bronze medal. The anticipation for finals day was very high amongst the BCKA team, a true mixture of nerves and excitement. First up to fight was Jack. Jack was in the final of his light contact category against a Canadian fighter. For boys elimination rounds had been one 2 minute round, however ALL finals were two 2 minute rounds. This wouldn’t be a problem for Jack having trained hard prior to coming out to Spain, Jack was in great shape and incredibly fit. Jack had been working a lot on his movement in training and this really showed as he moved around the mat controlling the fight and picking his opponent apart with head kicks and quick hand combinations. In all honesty Jack won the fight by at least a mile, there was never any doubt that Jack would have his hand raised as the new WKC World Champion 2011. 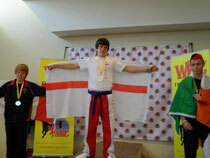 Alex Barrowman Jnr was next first in his points fighting final versus opposition from team England. Showing his class from the off, Alex took the first four points before his opponent was able to score anything. Alex was comfortably ahead at the end of the first round and in complete control of the fight mixing it up with his hand speed, power and head kicks. In truth Alex made it look pretty easy and this is testament to the hard work and dedication he puts into his training. 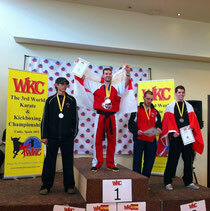 The fight ended with Alex’s arm lifted as WKC World Champion in the category that had evaded him the previous year. Almost as soon as he had finished fighting in the points fighting, Alex was straight on to fight again in the light contact final. Again fighting another English fighter Alex’s supreme fitness was there for all to see. Starting confidently with the swagger of the reigning World Champion Alex set about the task at hand taking apart his challenger with every technique. Mixing it up with jumping back kicks, spinning kicks, hook kicks and his exceptional work rate, Alex simply owned the mat. Ending the fight with a jump kick, there was only one winner. 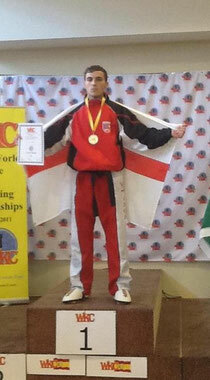 BCKA’s third world title of the day, Alex Barrowman Jnr was now WKC Double World Champion. Fourth up was Kevin Williams. Kevin was keen to bring home the title that had eluded him thus far in his fighting career and found himself up against a Canadian fighter. This fighter fights all over the world and hadn’t lost a fight for 18 months so Kevin knew he had his work cut out but set about things in typical fashion. Getting himself the first couple of points, Kev started strongly using his speed and evasive techniques to his advantage ducking under kicks and launching himself at the Canadian. By the end of the first round Kevin was 3 points down in a fight that had largely been point for point stuff. He knew he had to get on top quickly in the second round and that is just what he did, pressurising his opponent and scoring several quick points to take him back into contention. From this point on Kevin pretty much stayed in front eventually winning the fight 22-21 and being crowned WKC World Champion finally! So far so good for the BCKA with two more fighters left to fight next up was Lee Murray in the light contact. 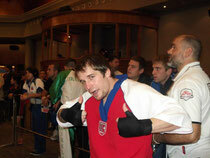 Fighting a full contact fighter from France, Lee was relishing this opportunity to take his first world title. Full of confidence from the elimination rounds Lee picked up where he had left off, moving around the mat and picking his opponent off. Looking completely comfortable and ease Lee began to pick things up, pulling off some amazing techniques and landing jump back kicks and spinning kicks whenever he seemed to feel like it. The French fighter could not handle Lee’s kicking ability and it became an inevitability that Lee was to be crowned WKC World Champion, making his the fifth world title of the day for the BCKA. Last to compete in the finals was Jo Redman. After last year’s disappointment in the final Jo was determined that the same thing was not to happen again. Jo was facing an Irish fighter who was also the reigning world champion. After a slow start to the fight from Jo she soon started to find her feet and show some of the impressive form that had got her into the final. With some great movement, timing and technique Jo started to take hold of the final landing a spinning side kick and some great side kicks as per in the elimination rounds and stunning her opponent. Jo had ramped things up another level in the second round putting a lot more pressure on the other fighter and getting her distances right. Having done more than enough to take the title Jo stood facing the crowd as her arm was raised to make her WKC World Champion and to take the sixth world title for the BCKA. After all the excitement of the finals the team gathered together around the podium waiting for each World Champion and bronze medallist to receive their medals and moment of glory. 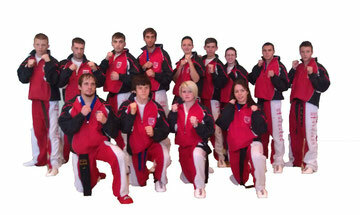 All in all it had been a great week for the BCKA with a total of 12 medals – 6 world titles and 6 bronze medals. 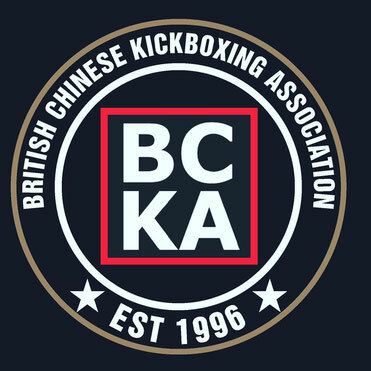 Each competitor from the BCKA that stepped onto the mat had truly done the BCKA proud, from Izzy in her kata endeavours to all those making their fighting debuts at world level to those who were experienced in this arena and to those who took world titles – nobody let the team down. The BCKA has the right mix of top class fighters and competitors, high quality coaches and fantastic supporters who travel with the team. 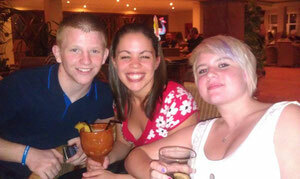 Now as the tournament drew to an end the team met together for drinks and dinner to celebrate their achievements. This year there was also a fight show to watch followed by a party in the bar. Unfortunately the next day was a day of travelling for the team, for some this meant abstaining from partying too hard, for others it didn’t seem to matter. The World Championships had truly been an amazing experience for the whole team and with next year’s event to be held in Canada, most of the team already had their eye on qualification and copious amounts of fund raising in order to win or defend a world title there. Photos by Adam Redman, Jeanette Collinson, Chris Bristowe & Debbie Dalton.